Tony Goldwyn came to talk to Michael and Chrissy Teigen. Michael said he’s a man of many talents both in front of and behind the camera. He didn’t get the presidential M&Ms. Teigen said she took them when she was there. Goldwyn said the Secret Service guys scared them. They said that they’re attractive though. Goldwyn talked about the Oval Office. They showed a picture of him in the Oval Office. His Oval Office on the show doesn’t have a ceiling, but they’re really similar. Teigen said you can’t take those pictures anymore. Goldwyn was nervous he was going to get arrested now. Goldwyn’s off from Scandal right now, so he and his wife took a trip to Big Sur. He grew up in California and had never been there. It’s beautiful. He said that the United States has a lot of great places you can travel to. Hollywood was always a part of Goldwyn’s life. His grandfather was one of the founders of the movie business from MGM, but he didn’t see many stars growing up. His parents wanted him to be normal. He met Katharine Hepburn when he was 16. He raised his kids on the East Coast and tried to keep them away from it too. Goldwyn’s doing another show called The Divide, which is a drama about trying to stop the execution of a man on death row. He co-created it, directed a few episodes and was the executive producer. He does it all! How does he have time? He loves doing different things, but sometimes it happens all at once. They sold the show to AMC and it’s going to be the first scripted show on the WE network next month. They sold it the same week he got Scandal, but they worked it out. Goldwyn has a new movie out called Outlaw Prophet: Warren Jeffs. It’s about a fundamentalist Mormon leader and was a big story in the news. 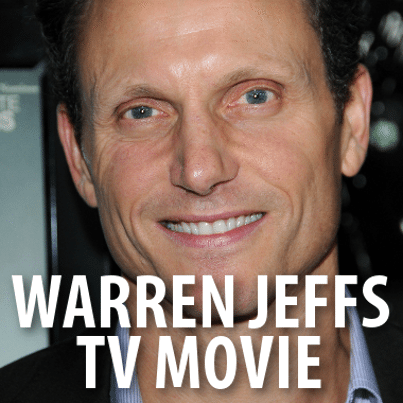 Goldwyn said he was arrested in 2006 and that it was a huge story because he practiced polygamy. He was their prophet. He was fascinated when it was in the news and then he got sent a script. He said it was a great part and that the character was “very disturbing.” It was really dark. The movie doesn’t shy away from it. Goldwyn researched by reading a bunch of books, but he also listened to the audiotapes. Jeffs was obsessed with keeping records of himself. He was a school teacher in the community and he used to record all of his lessons training girls on polygamy and the boys on how to behave. He also recorded the training sessions with his wives when he was the prophet in the language of the gospel. Jeffs has been in jail for almost ten years. He got two life sentences, but people still follow him. He still controls every aspect of the 10,000 people following him. He had 78 wives and 30,000 followers. Michael said it’s hard enough to keep up with one. They played a clip of Outlaw Prophet: Warren Jeffs. In the clip Warren Jeffs talked to a girl. He’s her uncle. She was hurt and said that her step cousin Allen did it. He said that it’s because she’s different and comforted her. Chrissy Teigen had chills and said Goldwyn needed to do a comedy. Outlaw Prophet: Warren Jeffs will premiere on June 28 2014 on Lifetime.